Koga is a Ninja that lives on the outskirts of Fuschia City in an old mansion. As the gym leader, he set up a number of traps in the mansion that the trainers have to overcome if they wish to battle him. With a number of students, including his sister Aya, Koga is constantly in training for both him and his Pokémon. Despite his Ninja like appearance, Koga is a very kind and well-mannered Person who cares about his Pokémon and enjoys seeing Pokémon of strong powers. 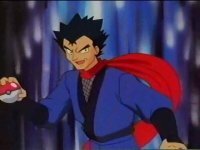 Although his first gym battle with Ash was interrupted by Team Rocket, Koga managed to get rid of them using the traps in his mansion and then had a rematch with Ash. Evolving from Venonat in battle with Ash as soon as it exits it's Pokéball, Venomoth manages to stand strong in battle, incapacitating Pokémon with it's Sleep Powder and Stun Spore attacks. However it's full strength in battle was not seen due to an interruption by Team Rocket. Koga offered Venomoth for Misty's Psyduck in a trade, but Misty refused. 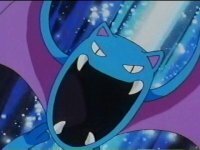 Golbat was used in Koga's final battle with Ash. Using it's powerful Screech attacks, Golbat was able to slow down Ash's Pokémon as well as the people around it. Golbat however did not fair well in battle and lost to Charmander's Flamethrower attacks. 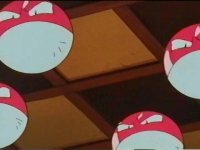 The many Voltorb in Koga's posession were used primarily as traps in the mansion. If they were tripped or released, then they would use their Self Destruct attacks to defend against the intruders. 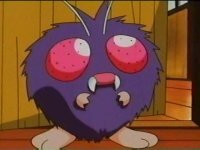 Koga's Venonat was only briefly seen. 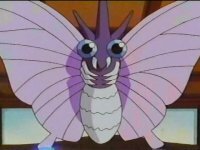 He sent it out in his gym battle against Ash and it quickly evolved into a Venomoth. This implies that Venonat has had a fair bit of experience prior to the gym battle with Ash.